When we sold our former home last summer, I sorted and purged as I packed. I thought I had gotten rid of all of our excess stuff. When we moved into our new to us home in September, I ended up getting rid of a lot more stuff as I unpacked. I parted with things that I didn't feel belonged in our new home, didn't fit somewhere, or I was just tired of. Then I bought Marie Kondo's books, The Life Changing Magic of Tidying Up, and Spark Joy. I went through everything again, parting with more things that I no longer loved. It was then that I realized, that I had collected some ironstone pieces just because they were ironstone and I had found them for a bargain while out thrifting. I ended up only keeping the pieces that I truly love and sold and donated the rest. And then, on a getaway last week we stopped at a favorite antique mall at one of our favorite beach towns. On our last visit there I had seen two ironstone bowls with a unique design I'd not seen before. I hadn't bought them then, and regretted it. They were still there, and I was able to dicker the price down, so I bought them this time. They are the two bowls on the right in the photo below. The moral of this story is, I make a terrible minimalist. Evidently, too many things "spark joy" for me! Well, it's almost Friday, friends. a safe and BLESSED weekend! 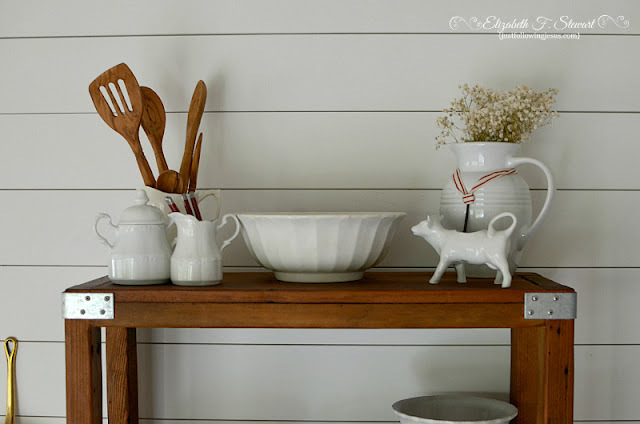 I love white ironstone too.. so pretty.. The two new bowls are beautiful..Proud they were still there for you.Hope you have a blessed weekend too. 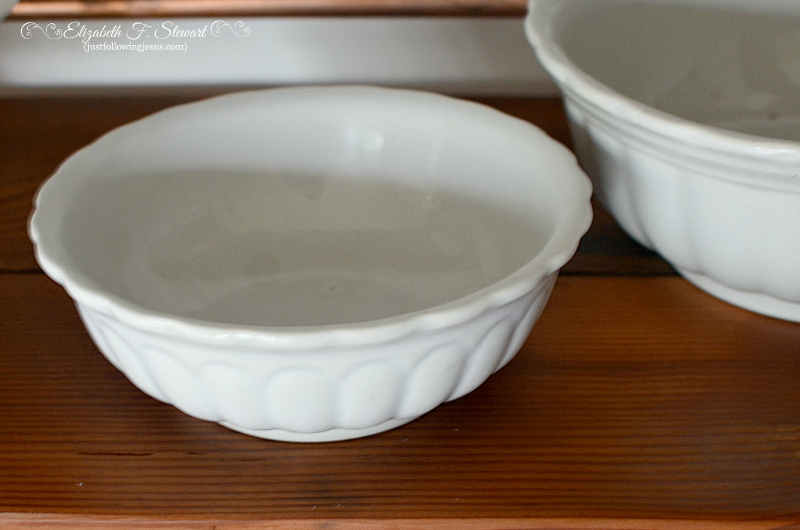 I loved the two new to me bowls as well! I was happy they were there waiting for me! There is something so unique and simple about white ironstone. I enjoy your appreciation of it, too. Christine, I'm drawn to many things that were actually useful household items in their former life...breadboards, ironstone, old quilts, etc... Maybe a connection to those in the past who also loved home and family. Oh I love ironstone! I only have a few pieces, but I'm always looking for more. 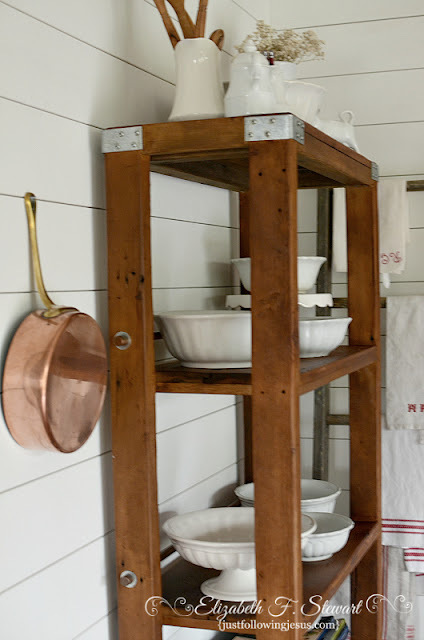 I really love that wooden rack you have, too! 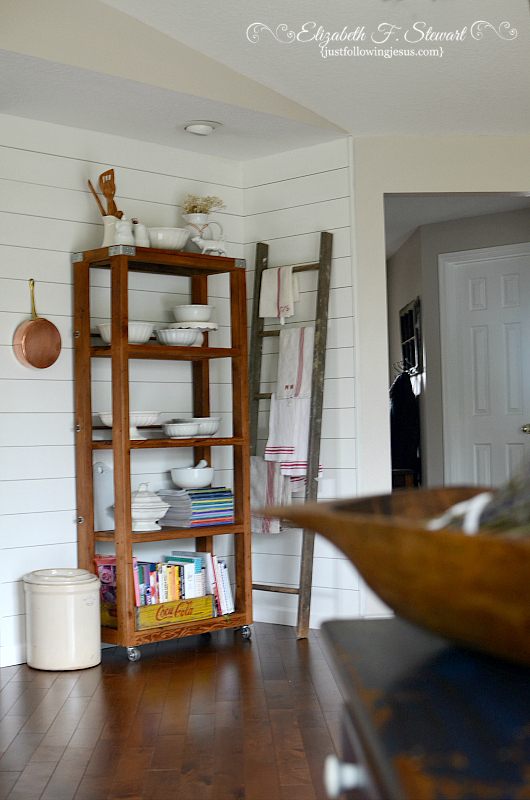 Meg, I commissioned a friend to make this shelf for me, loosely based on Restoration Hardware's reclaimed wood shelf. 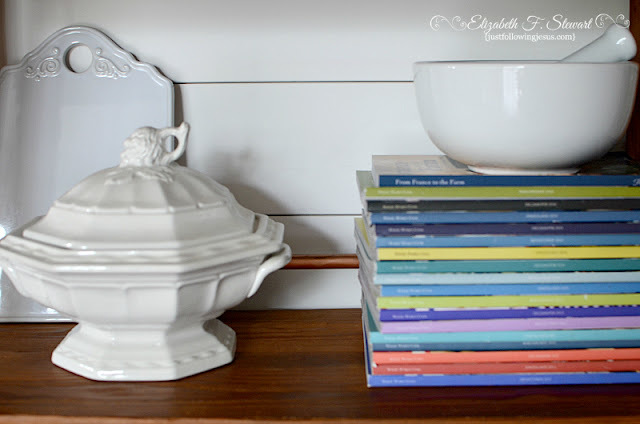 I love that book and your ironstone pieces spark joy in me too! I think they still pass the test if the point is to surround yourself only with things that bring you joy. Jen, so happy to see your comment here. I'm a long time follower of your blog! I think you make absolutely beautiful choices, Elizabeth. That sounds like a great deal! 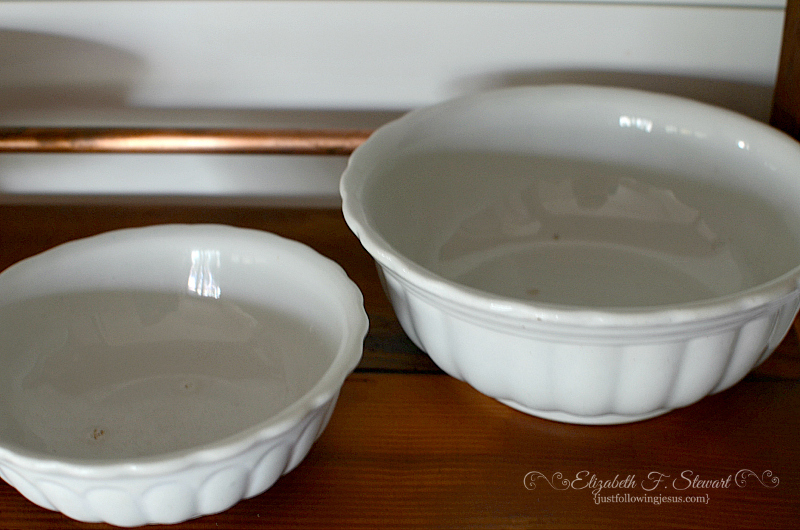 What pretty dishes. 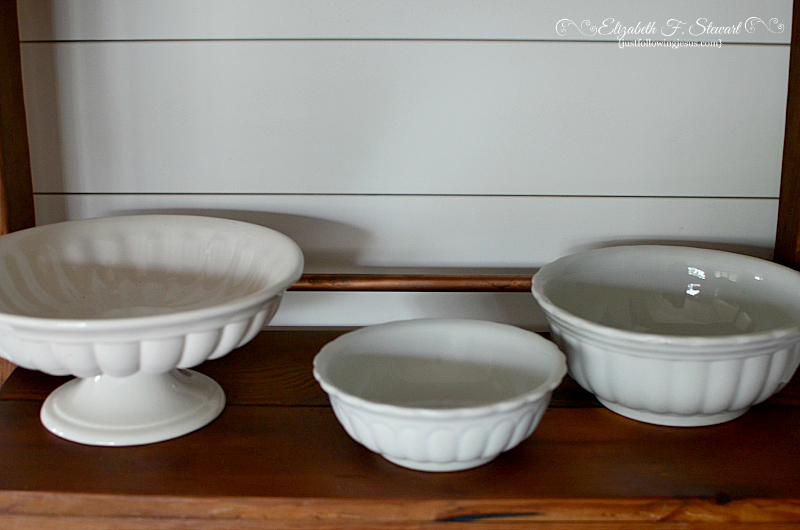 I am a sucker for pretty dishes. You display them so nicely and do such wonderful pictures. I should do a better job of using my dishes for pretty. They are just stored in my hutch. I need to make a goal of better decorating. You have inspired me! Have a wonderful week! Jaime, I do love dishes. Another area that I'm not a good minimalist! Home decor is one of my favorite things to do as well. I would make a terrible minimalist, too! Too many things bring me joy so I have to get real before I can deal with letting go. I'm in that process now. I know I'd never do well in a tiny house although there are times the thought appeals to me! 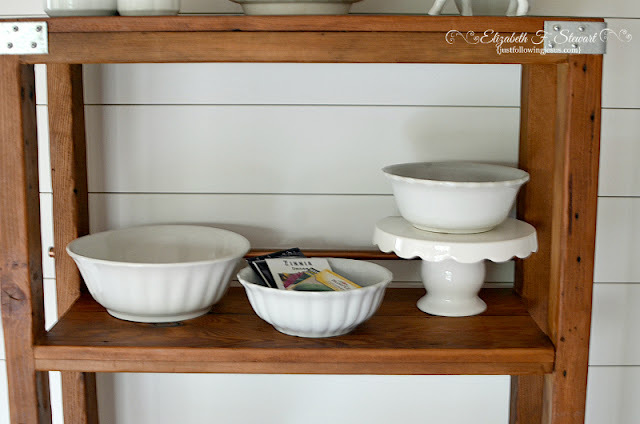 Love your ironstone. I need to 'weed out' my yellow Depression glass. I have five or six boxes on the shelf in the garage - they never come out to be used. I need to find a good place to sell pieces I don't keep. The antique store in Canby buys things sometimes from people!